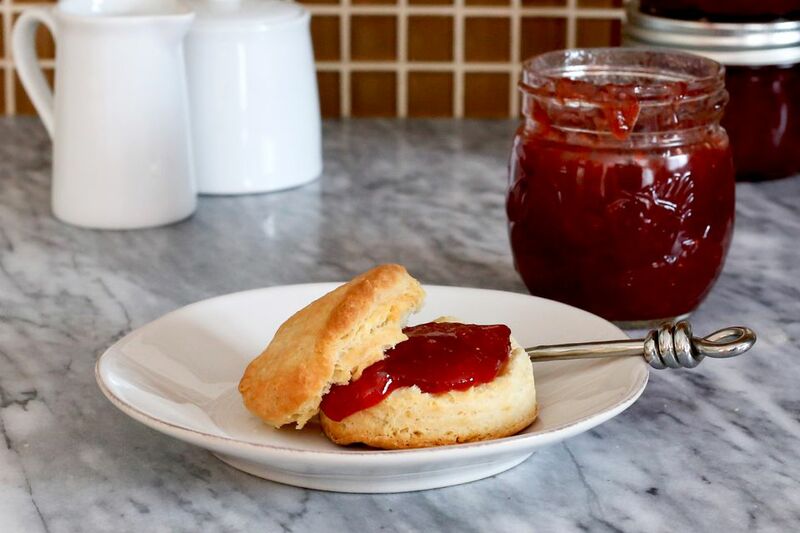 This jam is a celebration of spring strawberries and rhubarb. The combination of the two fruits has long been a popular one. The tart rhubarb marries beautifully with the sweeter strawberries. The strawberries also make for a deep red jam, a real plus if your rhubarb is more green than red. Making the jam without pectin does take more time than one made with pectin, but there is at least one important advantage. A strawberry-rhubarb jam made with about 4 cups of fruit and pectin requires 5 1/2 cups of sugar. This recipe is made with 9 cups of fruit and 5 1/2 cups of sugar; a stunning difference in ratio. You'll have a bit less volume, but a more fruit-forward jam with marvelous texture. A reliable candy thermometer is recommended. If you don't have a candy thermometer, test the gel point using one of these methods. Rinse the rhubarb and slice it into 1/2-inch pieces. You should have roughly 5 cups. Hull the strawberries and rinse them under cold running water. Let them dry and then slice thinly. You should have 4 to 5 cups of sliced strawberries. In a large, nonreactive pot, combine the prepared strawberries and rhubarb with the granulated sugar. Stir to combine. Cover the pan and let it stand at room temperature for 2 hours or refrigerate for up to 12 hours. Place seven clean, half-pint jars in a large canning kettle and cover with water. Bring the water to a boil. Reduce the heat to low to keep the jars hot while you prepare the fruit. Place the lids and rings in a saucepan; cover with water and bring to a simmer. Keep the lids in the hot water until you're ready to seal the jars. Add the lemon juice to the fruit and place the pan over medium-high heat. Attach a candy thermometer to the pan. Make sure the tip of the thermometer does not touch the bottom or side of the pan. ﻿Bring the fruit to a boil, stirring constantly. Reduce the heat to medium and continue cooking until the jam reaches 220 F, stirring frequently. When the jam reaches about 216 F, begin stirring even more frequently to prevent scorching. Remove the jam from the heat and skim off any foam. Stir for a few minutes and then ladle the jam into the hot jars, leaving 1/4-inch headspace. Wipe the jar rims and threads with dampened paper towels. Carefully place the lids on the jars and screw on the rings. Don't over-tighten the rings and keep the jars upright. Place the jars on the canning rack and lower them into the canning kettle. If the water is not at least 1 inch above the jars, add more hot water. Bring the water back to a boil. Lower the heat to medium-low and cover the pan; boil gently for 10 minutes. If you are working at an altitude of over 1,000 feet, see the table below. Remove the pan from the heat and let the jars stand in the water for 10 minutes. With tongs, remove the jars to a rack to cool (upright) completely. If any jars did not seal, refrigerate them and use right away. 1.001 to 3,000 feet: Add 5 minutes to the processing time. 3,001 to 6,000 feet: Add 10 minutes to processing time. 6,001 to 8,000 feet: Add 15 minutes to the processing time.